4. Product size: (approx.) handle length: 39 cm/15.35'', rope length: 110 cm/43.31"
(1) Stand, hold the reel and roll up the hanging weights with strength. First, wind it clockwise, and then rewind it counterclockwise. Repeat the action. This exercise can make the forearm muscle to be thicker and stronger. In addition, exercises such as gripping grippers, grasping barbells, etc. are also effective methods for developing forearm muscles. (2) It's enough for you to exercise forearm muscles once every three days. When exercising, you can select 2-3 movements according to your needs. Repeat 15-20 times for each movement. The trainer is supposed not to be too heavy to avoid injury. 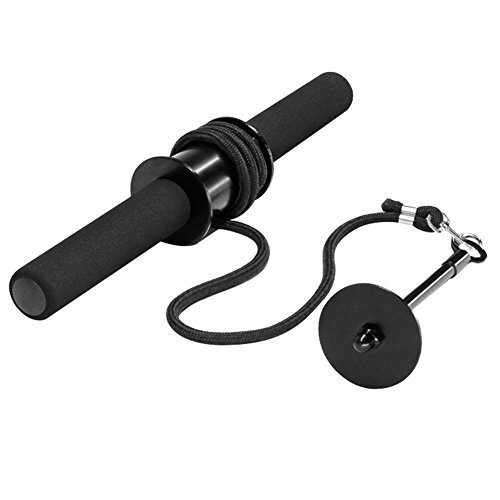 Perfect for training for all sports and as a rehabilitation tool for hands and forearms. Padded foam grips minimize hand fatigue and provide maximum grip. If you have any questions about this product by Alian, contact us by completing and submitting the form below. If you are looking for a specif part number, please include it with your message.